Use the right products to mimic Angelina Jolie's flawless makeup look. If you have redness, blemishes and an uneven skin tone, you too can have the appearance of clear skin à la Angelina Jolie, Jennifer Lawrence or Beyoncé Knowles. Whether you are a makeup maven or a barefaced beauty, using a few star-inspired makeup tricks will lend a flawless canvas to paint to your heart's desire. If you have an uneven skin tone, makeup artists typically use primers to create a smooth canvas for makeup application. After applying a lightweight moisturizer to plump your skin, use a dime-size amount of primer to create a protective base and the perfect surface for your foundation, concealer and powder. Celebrity makeup artist Christy Coleman recommends using primer to prep eyelids for a flawless makeup application. Most primers are clear and colorless, but tinted primers can help disguise blemishes and cover redness or sallow skin tones. You can use a light and creamy concealer to cover redness, blemishes, broken capillaries and other small skin imperfections. Celebrity makeup artist Bobbi Brown says on her website that a concealer is her "desert island cosmetic” that she couldn't do without. 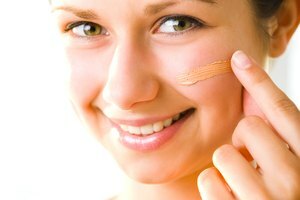 To cover any under-eye circles, Brown recommends that you apply a yellow-based matte concealer that is one shade lighter than your natural skin tone to conceal the dark under-eye circles. Use your index finger or a concealer brush to pat the product into the delicate under-eye area. The perfect foundation shade gives your skin the appearance of a radiant, even complexion. Foundation formulas include liquid, powder, tinted moisturizer, mousse, mineral powders, cream-to-powder and spray, and should be selected based on skin type and desired coverage. The right foundation color should disappear into the skin when you test the product on your jawline. Hollywood makeup artist Tyrone Taylor recommends choosing two foundation colors -- one shade lighter and one shade darker than your natural skin tone -- if you have an uneven skin tone. To apply, pat on the light-colored foundation with a sponge to highlight the areas in the center of the face, and then smooth on a darker foundation using a foundation brush around the outer perimeter. 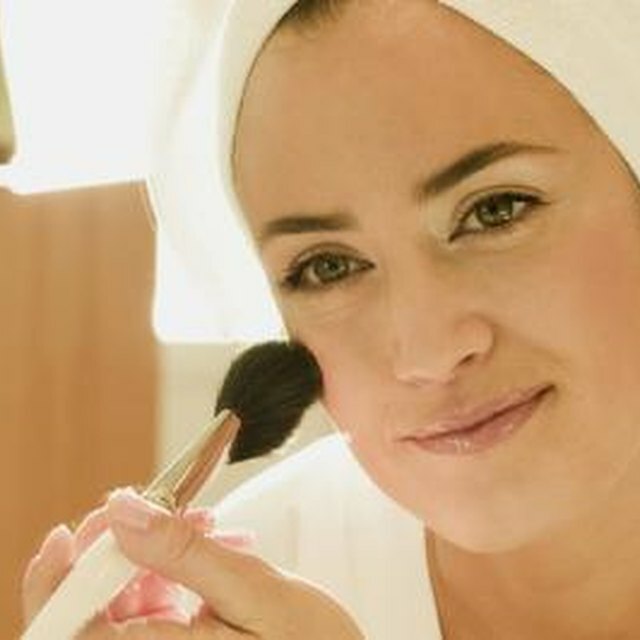 Makeup artists use powder to set foundation, control shine and extend the life of the makeup application. To help even out your skin, the right powder should complement the color of your foundation. Apply the product by sweeping on a translucent powder or a foundation-matching pigmented powder with a large brush. To create a flawless look that lasts, use a fluffy brush to sweep powder under the eyes, over the T-zone and around the mouth, says celebrity makeup artist Pat McGrath. 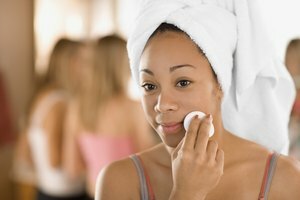 If your skin is flaky or dry, only use powder to reduce the shine on the nose. Abney, Mimi. "Hollywood Makeup Tricks for Uneven Skin." Synonym, https://classroom.synonym.com/hollywood-makeup-tricks-uneven-skin-23586.html. Accessed 23 April 2019.